It is my desire to demonstrate that communication is paramount. A beautiful TENERA FAJANCE vase. Decor design by Grethe Helland Hansen for ROYAL COPENHAGEN, Denmark. It is signed at the bottom with the R. C. 3-wave logo. This vase will be a nice add of DANISH MODERN to your interior decor. 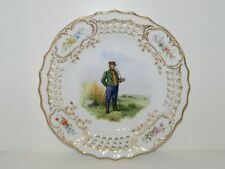 Royal Copenhagen Rare plate with pierced border. This is with a Girl from the Island Laesoe. Marked with the Royal Copenhagen "Crown" trademark, "ROYAL COPENHAGEN, DENMARK" with the three wavy lines and the number 48. This well known pattern was designed by Arnold Krog and introduced in 1775. 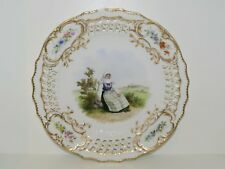 Royal Copenhagen Rare plate with pierced border. This is with a Man from Sealand. Manufacturer: Royal Copenhagen. China - Dinnerware Crystal & Glassware Silver & Flatware Collectibles. World's Largest Selection of Old and New Dinnerware. Pattern: WHITE PLAIN. Canadian and international orders. Royal Copenhagen. The platter---13&1/8". Pattern: Golden Basket. This pattern blends well with white and gold fine china. Royal Copenhagen candle light holders in pillar shape. White porcelain with gold decoration. The factory mark shows that this was produced before 1894. This model was designed before 1800. ENERET ROYAL COPENHAGEN CLASSICAL FEMALE FIGURINE! FREE DOMESTIC SHIPPING! INCISED "ENERET" BACK OF BASE. ROYAL COPENHAGEN MARK ON BOTTOM. YES HER LEFT FOOT IS MISSING. A Royal Copenhagen vase designed by Berte Jessen in the 1960's. FRIJSENBORG # 910-1871. A beautiful and elegant GRAVYBOAT with Attached Underplate. Produced by ROYAL COPENHAGEN, DENMARK. Cream white with gold rim. Little to no signs of use. GOLDEN BASKET # 595 - 9045. A beautiful and elegant Triangular CAKE DISH. Produced between 1928 - 1935 by ROYAL COPENHAGEN, DENMARK. Royal Copenhagen porcelain 22741. Elephant / young elephant. White glaze. Royal Copenhagen porcelain 22741. Elephant / young elephant. White glaze. Early stamp, Cirka 1920. WHEAT By Royal Copenhagen Denmark. Mustard Pot No Lid. NEW NEVER USED OR SOLD. AS SHOWN. We can't fix a problem we are not aware of, and would appreciate the opportunity to make things right for you. GEORGIAN By Royal Copenhagen Denmark. 5 Piece Place Setting. NEW NEVER USED OR SOLD. Designed by Thorkild Olsen in 1952. DAGMAR By Royal Copenhagen Denmark. NEW NEVER USED OR SOLD. Gold trim. There appears to be a scratch through the maker's mark indicating second quality. 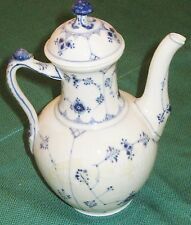 This Royal Copenhagen blue fluted half lace coffeepot no. 519 was made between 1889 and 1922. It was designed in 1888 by Arnold Krog and is made from porcelain. The Pot is 9 3/4" Tall with the lid 7 1/2" across from handle to the point, and it weighs 11.38 Ounces. Royal Copenhagen Denmark Josephine 8.38" Salad Plate New Briliant White Porcelain with hand applied gold border Made in Denmark INCLUDES: 1 Salad Plate ​New no box. ANTIQUE ROYAL COPENHAGEN SEASONS BISQUE PORCELAIN-WHITE WALL PLAQUE - FALL/AUTUMN/ADULTHOOD Plaques are in excellent condition with no notable flaws. VERY NICE!! Shipped with USPS Priority Mail PLEASE MESSAGE ME WITH QUESTIONS OR CONCERNS AND BID WITH CONFIDENCE AS I LOOK FORWARD TO YOUR POSITIVE FEEDBACK. THANK YOU AND GOOD LUCK!!!!! This stamp is from 1903 - 1969. Royal Copenhagen Nils Thorsson Plate. Local Purchasing. Local Pickup. Do you live in the greater Chattanooga area?. Decorated on the flecked and speckled stoneware body with butterflies in shades of brown, blue and grey amongst grasses. Royal Copenhagen 13" serving platter ribbed rim with gold trim. ROYAL COPENHAGEN. B&G PORCELAIN. MADE IN DENMARK. GREAT COLOR! IT IS IN GREAT CONDITION. X 23 cm / 9 1/16 in. This discontinued pattern, Blue Flowers Braided from Royal Copenhagen was produced from 1780-2112. This dish looks like it's never been used. GEORGIAN By Royal Copenhagen Denmark. Mustard Pot. NEW NEVER USED OR SOLD. Designed by Thorkild Olsen in 1952. 2.4" at the lip. Porcelain Hand Painted Designed by Anne Marie Trolle in 1970. DOMINO BROWN By Royal Copenhagen Denmark. Sauce Jar #14909 DOTS 2. NEW NEVER USED OR SOLD. Royal Copenhagen Salto gravy sauce boat with handles Denmark white.Approx 6-1/2 inches long Shipped with USPS Priority Mail. ROYAL COPENHAGEN Mid Summer Night's Dream Porcelain 8 7/8" Fish Plate (B) -RARE! Up for sale is an 8 7/8" wide Royal Copenhagen plate. It is in amazing condition! Royal copenhagen Domino gravy boat in excellent condition. This was my Mother's "good china". Classic mid-century modern design. Manufacturer: Royal Copenhagen. Piece: Salad Plate. Pattern: WHITE PLAIN. China - Dinnerware Crystal & Glassware Silver & Flatware Collectibles. Canadian and international orders. U.S. Expedited. WHITE FLUTED HALF LACE By Royal Copenhagen Denmark. NEW NEVER USED OR SOLD.